It's Just Mobolaji | Music & Entertainment: Top 5 Songs Of The Moment! Top 5 Songs Of The Moment! 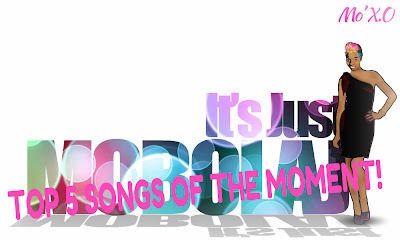 Every now and then, one of my favourite urban websites - That Grape Juice does this "Top 5 Songs Of The Moment" blog post. And I thought, why not share with you my top 5 songs of the moment as well. These top 5 songs are the most played songs on my iTunes folder, my phone and every other device that I have right about now. 5 of my favourite songs by 5 of different artists! What are your top 5 songs of the moment?